Welcome to the Dark Horse Comics Pubwatch by WWAC! This Pubwatch will recap all the latest comic releases and publisher news from June 2018. Well, hello there, lovely readers. It’s been a while. Almost a year, in fact, since my last installment of Presenting Dark Horse. While I have a million and one reasons to explain my absence—such as becoming an editor for WWAC’s own Bookmarked section, and so many wonderful freelance writing gigs over the last several months—I can’t help but return to you all with my tail between my legs, here. This little column is my baby, and I’ve missed it and you. But it’s a new year, and a new me™. I’m letting you know that I’m lacing up my boots. I’m gearing up my ride, and I’m happily hopping back onto the saddle. I’m bringing this pony show back on the road, and I’m chomping at the bit to get started again! And if you join me on this journey, I promise you that I will stop with all the horse-related puns. Maybe. Becoming an adult is a hard transition for many of us. It is a strange time in which we must balance our idealistic childhood aspirations with the more economically limited and distinctly less glamorous realities of everyday life. Being immersed in really nerdy entertainment only seems to exacerbate these disappointments. I mean, I was certainly devastated when I didn’t get my Hogwarts letter as a preteen, even though I intrinsically knew that fantastic possibilities like that were entirely fictional. Thank goodness for that lack of attainability. Otherwise, I would be as miserable as Sage of the Riverlands, constantly reminded of my maddening ordinariness in the truly fantastic world of Rafer Roberts and Kristen Gudsnuk’s Modern Fantasy. Sage is a young professional trapped at a dead-end corporate job, living with her best friend and a few unwanted moocher roommates, trying to revive the cooling corpse of her love life, and dreaming of a more fulfilling life of action and adventure. The ennui of her life is contrasted by her incredibly magical environment: reptile wizards, fairies, and dwarfs sit next to her on her morning commute, her cell phone is a magically powered scroll, and her city’s skyline prominently features a magical floating castle. Gudsnuk’s colorful, cartoonish art style accentuates this world’s whimsical appeal. But as a relatively ordinary human, opportunities for a grand quest seem forever beyond Sage’s reach. Consider this four-part series a crossover special between the world of Harry Potter and the millennial struggles captured in, let’s say, HBO’s Girls. 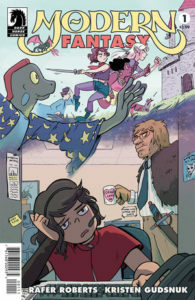 I love a good magic-meets-mundane story, and the immediacy through which Roberts and Gudsnuk showcase this narrative tension is their first issue’s biggest strength. There are no overly long expositions in this tightly woven plot, no hand holding as you traverse into its cryptozoology or historical foundation. The world of Modern Fantasy has basically always been like this, and its uniqueness is no different from other real life metropolises. This demonstrates an intrinsic trust in the adaptability of readers that often feels rare these days, and one I greatly appreciate. I also appreciate the series’ dedication to race and sexual diversity between its human and magical creature populations alike, as fantasy and comics still have a notorious Straight White Male problem no matter how expansive its world-building may be. 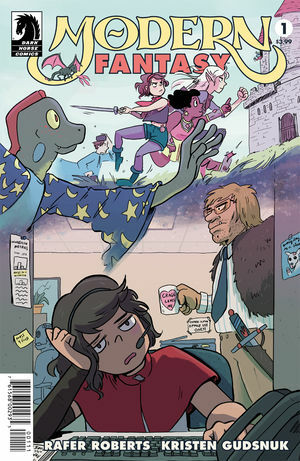 Modern Fantasy feels like it will be a short and breezy read, but the drama already present in this first issue has definitely piqued my interest enough for me to be on the lookout for the next issue. Since the Golden Age of superheroes, many creators have explored the social impact of superpowered individuals on the general population. These stories come in all shades: alien invasions and government conspiracies, love stories and family drama, thrilling Bildungsromans and tragic adult ruminations. Overwhelmingly these societal clashes are violently negative, an assurance that these forces are far too different to coexist. Yet, despite the literary precedent, Christopher Cantwell, Martin Morazzo, and Miroslav Mrva make a valiantly ambitious case to prove the potentially positive coexistence of these communities, as well as numerous different genres and plots, in the first issue of She Could Fly. One hot day in a Chicago indistinguishable from our very own, a mysterious woman begins to soar above the city. While her time in the sky is unfortunately brief, the impact of her appearance is far-reaching. Our teen protagonist Luna quickly comes to identify the flying woman as her personal savior, one whose impossible powers offer Luna a kind of liberation from the violently intrusive thoughts that otherwise plague her life. Meanwhile, in Canada, an aging scientist named Earl is desperately trying to evade the growing sense of dread he feels about his involvement in the flying woman’s creation, as well as the several secret international organizations that either want to exploit his talents or bury them, permanently. And it is clear that all these forces are quickly moving on a collision course of epic proportions. This latest addition to Dark Horse’s Berger Books imprint follows the line’s experimental examination of the dark, provocative, and charmingly unusual recesses of its creators’ imaginations. 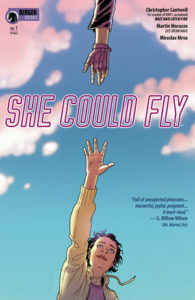 Yet, She Could Fly hits multiple familiar narrative beats right from the start, easing readers into the setting and its genre-specific themes in a way that at times feels just a little too safe given the prevalence of these kinds of stories. The first issue’s most innovative moments by far come from Luna’s narration. As Cantwell notes in his “In Flight” notes section, Luna shares with him a diagnosis of primary obsessional OCD, and her thoughts usually cycle around the idea that she will accidentally or purposely hurt the people around her. Images from her obsessional thoughts appear in the issue at random moments, and their ominous inevitability permeates every moment of the story thanks to the Steve Dillon-esque grittiness of Morazzo’s artwork and the careful dance of light and darkness captured in Mrva’s coloring. As Luna forages for a connection with the flying woman, I find myself unwittingly developing a connection to her and empathy for the relatability of her inner demons as well. The success of this miniseries is contingent on readers’ enthusiastic involvement in Luna’s journey, and right now that journey feels like a satisfyingly interesting endeavor to invest in. Between Marvel’s frequently expressed social/cultural insensitivity and the occasional matrimonial misfires of DC Comics, I have always considered Dark Horse to be one of the few comics publishers to exist without any major controversies. But that’s just not realistic, now is it? Call it naivety, or bias, or my still burgeoning understanding of the comic book industry’s more checkered operations. As I restart this Pubwatch, I will commit to being more proactively interrogative of the news I consume, and share this news with you to help promote continued growth and creator/consumer protections in the industry-at-large. And funnily enough, there was some concerning news that went down just last month. June 2018 was Pride Month in the United States, a time when many corporations temporarily adopt the veneer of queer acceptance whether or not they actually practice this tolerance in their daily business operations. Like many other comic publishers, Dark Horse announced a Pride Month sale of its popular queer-friendly titles, like Black Hammer and ElfQuest. In response, however, trans comic critic, X-Plain the X-Men podcast creator, and former Dark Horse editor Jay Edidin took the publisher to task for its exclusionary in-house healthcare insurance. As noted in Edidin’s post, these policies explicitly stated that Dark Horse’s insurance does not provide coverage for “anything related to gender dysphoria and transition.” While these unfortunate policies are technically not prohibited under Oregon state law, since Dark Horse acts as a self-insured company that provides its own health insurance to employees, they effectively disadvantage the publisher’s trans and non-binary employees who are already in a vulnerable position when it comes to their healthcare needs in this country. Besides, in an industry already plagued by endless interpersonal and systemic acts of discrimination against marginalized populations, explicitly exclusionary policies such as this are harmful and dangerous to uphold. Dark Horse subsequently released a statement about the situation, which Edidin and numerous other commentators stated failed to address initial concerns about the publisher’s apparent lack of commitment to changing its healthcare policies. 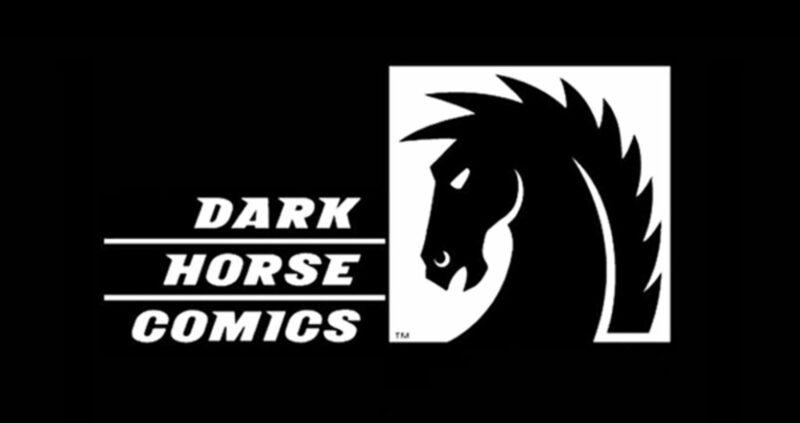 Finally, Dark Horse issued another statement that acknowledged its failings at creating an inclusive environment for its employees and provided a concrete timeline for the expansion of its healthcare coverage. As our society becomes more progressive in our understanding and acceptance of the diversity inherent to the human experience, we must continuously challenge the institutions that we love to embrace this diversity and better serve its multitude of unique needs. The work Edidin, other trans creators, and allies did to shed light on Dark Horse’s unfortunate healthcare policies was a brave and highly commendable act, one that represents the greatness of the comic book industry’s more inclusive circles. At the same time, Dark Horse should also be commended for finally listening to these concerns and explicitly committing itself as a publisher to decisive change. It’s a step in the right direction that other comics publishers time and again fail to do. More concerns may arise within Dark Horse, or any other publisher really, about the way it treats and interacts with marginalized communities; it’s almost an assured inevitability. However, the publishers that will be able to sustain themselves in the wake of these unveiled issues and ultimately thrive beyond them will be the ones who acknowledge their mistakes and make explicit strides to do better. And, at least from my limited outside perspective, it looks like Dark Horse has the ability to do just that. Come celebrate Dark Horse’s 30 years of manga with special panel guest Yoshitaka Amano! One of the most honored Japanese fantasy, science fiction, and video game illustrators, Amano has released more works in English with Dark Horse than with any other publisher. We’ll have previews of our forthcoming illustrated biography of Yoshitaka Amano, and of course, a discussion of his life and career with the book’s subject, the artist himself! 1) A very exhausted post about this year’s San Diego Comic-Con! I’ll be there for the first time ever, reping with the rest of the WWAC team. It’s gonna be a blast! 2) More new comic and book reviews! 3) God willing, no more controversy!